On an unusually warm February evening, during the ride back to their apartment, Sonja mentioned that their wedding anniversary was coming up in June and that it would be big one. “It’s 30 years”, she told me. “Yes”, said Bob, “we want to renew our wedding vows”. I tried hard not to hit the car in front of me. And that’s how The Wedding of the Century came to be (actually, The Second Wedding of the Century). 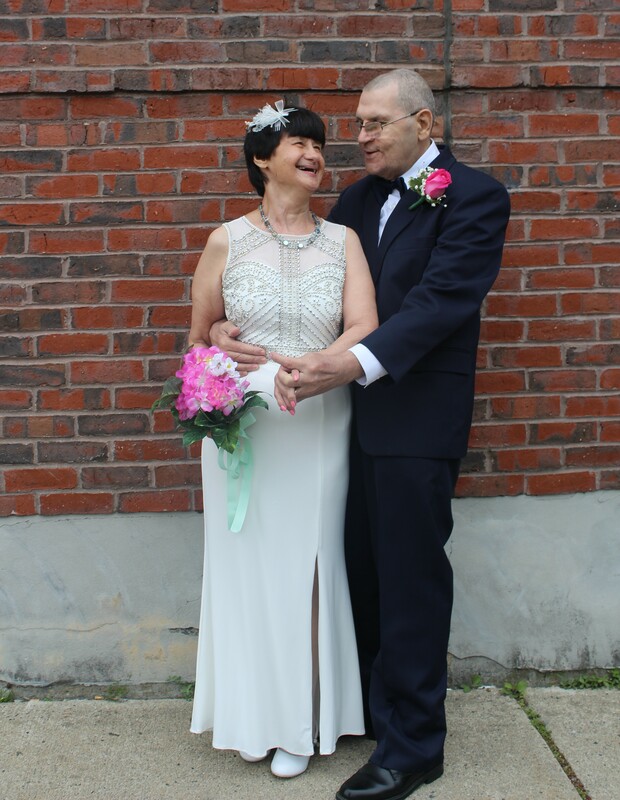 On June 15, 2018, they celebrated their 30th wedding anniversary in style. 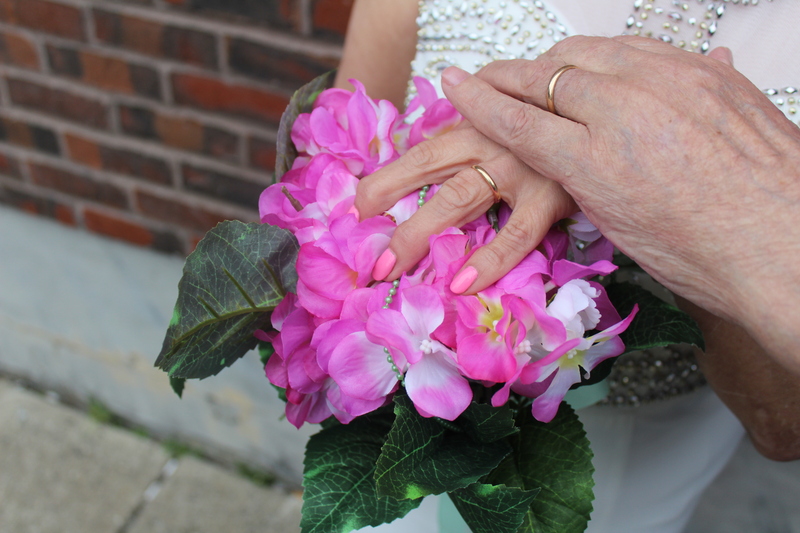 They arrived at Sacred Heart Parish – where they’d originally been married – in a limousine. Bob tires easily now so he sat in a pew near the altar until he was met by Sonja, who was escorted by Kevin Leahy – the Executive Director of the Agency. When asked if was nervous, Bob said, “no, I already did this once”. After they’d shared a kiss – amid loud cheers and clapping from all of their guests – there was the reception. Bob’s favorite part was the cake. He wanted to smear it on Sonja’s face but being the perfect gentleman that he is, he did not. Sonja’s favorite part was the dancing: she is particularly fond of The Electric Slide. But things haven’t always been so easy for Bob and Sonja. They dated for several years before they became engaged. They went to a store to buy what Sonja thought was a promise ring. The sales clerk told her that it was an engagement ring and right there, Bob got down on one knee. He had practiced with CHS staff to learn just how to do it. Their wedding was talked about for months afterward not only by the couple, but by the many CHS staff who had arranged it. Statistically, persons with disabilities are 4 to 10 times more likely than non-disabled persons to become victims of violence, abuse, or neglect. Both Bob and Sonja are part of those statistics. During their first year of marriage, Sonja’s past caught up with her. She became so distraught that it caused depression, resulting in hospitalization. CHS staff supported her throughout. Bob’s issues, coupled with an inability to articulate what he was experiencing, caused him to lash out in inappropriate ways and again, CHS staff was there modeling correct behavior, providing counseling and adding extra staff in the home. When Bob became ill, CHS again circled the wagons. Bob has weekly doctor’s appointments. CHS Staff arranges all of his appointments, provides transportation and meets with the hospital staff. CHS staff is with the couple 7 days per week to ensure their well-being. There are also clinicians who check in weekly regarding their emotional health. Marriage is a difficult enterprise in the best of circumstances. It entails compromise and honesty, while still trying to maintain a sense of individuality. Bob and Sonja make it look easy. That is a testament not only to them, but to the countless CHS staff who have helped them navigate the institution of marriage. Congratulations to Bob and Sonja; may you have many more years of wedded bliss. *Content contributed by Kerstin Lochrie, Individual Supports Program Manager at Cooperative for Human Services, Inc.